Palm kernel shell (PKS) and empty fruit bunches, both raw (EFB-R) and pretreated by means of autoclaving (EFB-A) and microwave (EFB-M), were pyrolyzed in a fixed-bed stainless steel reactor at 550 °C. The yield of the water-soluble liquid fraction (pyroligneous acid, PA) in the pyrolysis of PKS was 26%wt. (dry basis) and in the range of 16–46%wt. when different EFB were used. The yield of insoluble liquid fraction (bio-oil, BO) was 9.1%wt. for PKS and up to 25%wt. in the case of EFB. Liquid and gaseous products were analyzed by conventional capillary gas chromatography. The PA from the PKS had 30%wt. of total phenolic compounds (up to 24%wt. phenol) and 46%wt. acetic acid. On the other hand, the bio-oil from PKS had 43%wt. of total phenolic compounds (up to 26%wt. phenol) and 17%wt. acetic acid. The PA from EFB contained mainly acetic acid (65.5%wt. ), furfural (7.7%wt. ), methanol (8.0%wt. ), and phenol (15.2%wt.). When EFB was pretreated, the concentration of acetic acid in PA decreased dramatically, while the concentration of furfural increased up to ten times, this effect being more noticeable in the case of microwave pretreatment. The yields of by-products were of significance in all cases (13–23%wt. of gases and 33–52%wt. of char). 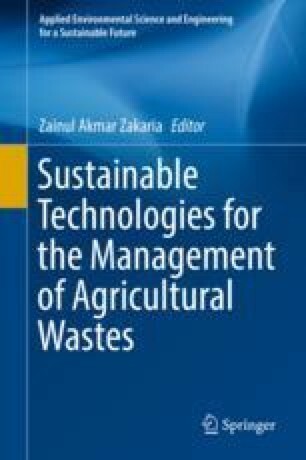 These results show that the liquid products obtained from the pyrolysis of palm oil industrial wastes could be used in order to obtain chemical raw materials of worldwide extended use, while the by-products (gases and char) can be used as renewable energy sources. This work was performed with the financial assistance of Universidad Nacional del Litoral (Santa Fe, Argentina), Secretary of Science and Technology, Proj. CAID 2011 #501-201101-00546LI; Consejo Nacional de Investigaciones Científicas y Técnicas (CONICET, PIP 593/13), and the CONICET-UTM bilateral international cooperation project. The authors also acknowledge Universiti Teknologi Malaysia (UTM) for the Flagship Grant (03G44) and Postdoctoral Fellowship Scheme to Teo Chee Loong, Ministry of Education Malaysia for the MyPhD scholarship to Khoirun Nisa Mahmud, and Public Service Department for the King’s scholarship to Suzami Junaidah Ariffin.